According to a new market research report published by Transparency Market Research titled “Portable Gas Detection Market [Product Type – Wearable and Non-wearable;Gas Type – Combustible, Oxygen, and Toxic;Application-Single Gas and Multiple Gas; Industry- Oil & Gas, Mining, Building/ Construction, Wastewater Treatment, Fire Services, Chemical & Pharmaceutical, Others (Utilities & General Industry)] – Global Industry Analysis, Size, Share, Growth, Trends and Forecast, 2018 – 2026,” the portable gas detection market across the globe is anticipated to reach US$ 2352.6 Mn by 2026. The market is expected to expand at a CAGR of 5.9% during the period 2018-2026. 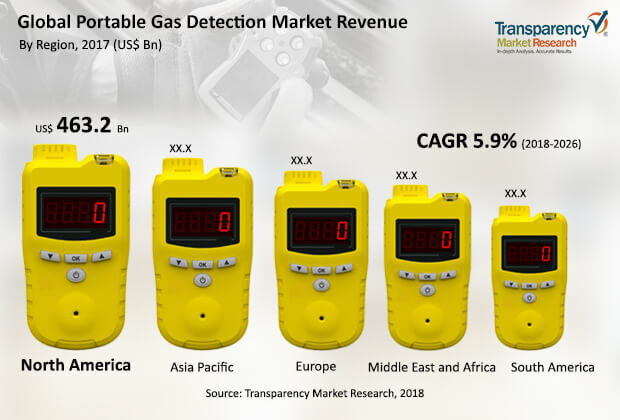 The portable gas detection market based on product type includes wearable portable gas detector and non-wearable portable gas detector. Non-wearable portable gas detector is expected to expand at a faster rate compared to its counterpart. The non-wearable portable gas detector is ideal for all applications as the cost of the product is reasonable and has comparatively better additional technological features such as low power consumption, along with Bluetooth, cellular technology, and Wi-Fi sensors embedded in the product itself. Based on gas type, portable gas detectors are segmented into combustible, oxygen, and toxic. The global portable gas detectors market has been segmented on the basis of application into single gas and multiple gas. On the basis of industry, portable gas detection equipment can be categorized into oil & gas, mining, building/ construction, wastewater treatment, fire services, chemical & pharmaceutical, and others (utilities & general industry). The growth in the global portable gas detection market is primarily due to increasing demand for technologically advanced gas detectors. This is due to the need for enhanced performance, to reduce work redundancy, and to offer reliability. Growth in the industrial sector such as oil & gas, chemicals & energy, manufacturing, and chemical & pharmaceutical is also expected to deliver growth for the portable gas detection market. In the current scenario, the global portable gas detection market is highly fragmented. However, there are a few well established players having strong distribution network and providing integrated and advanced solutions across different industries. The companies are strengthening their position through merger &acquisition and continuously investing in research and development (R&D) activities to come up with solutions to cater to customers’ requirements. North America is the largest region in the portable gas detection market. The North America portable gas detection market for wearable portable gas detectors is expected to expand at a CAGR of 6.9%. Demand for portable gas detectors in North America is likely to grow rapidly in the U.S. and Canada owing to presence of a large industrial sector in the region. According to the report, the Asia Pacific portable gas detection market is expected to expand at a CAGR of 6.3% in terms of revenue. South America and Middle East & Africa are expected to expand at a CAGR of 6.1% and 6.0% respectively in the portable gas detection market. The market in Europe is expected to grow at a gradual rate. The portable gas detection market is highly competitive with a large number of players present across the globe. Some of the leading industry players profiled in the study include Honeywell International Inc., MSA, Riken Keiki Co., Ltd., Industrial Scientific Corporation, Dragerwerk, HalmaPlc, Trolex Ltd., General Electric Co., Emerson Electric Co., and Thermo Fisher Scientific Inc.